There are 24 hours per day and 7 days per week. That is a total of 168 hours per week. If you sleep 8 hours each night then you are asleep for 56 total hours per week. That leaves 112 hours per week and if you work 40 hours per week that represents about 36% of your waking hours at your job. Add to that the hours you spend getting ready for work and getting to and from work and most of us give up about half our our awake time to our employer. 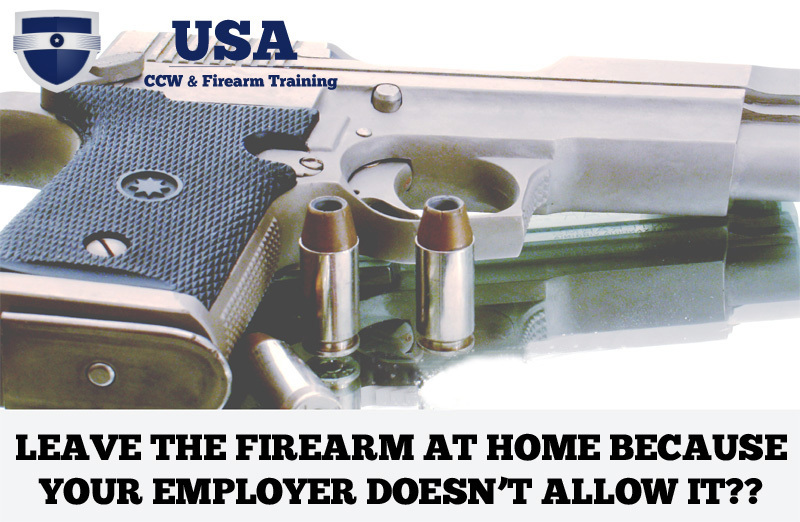 If your employer doesn't allow you have your firearm with you at work that could be a legitimate reason for us to stop carrying a concealed firearm. -Criminal or Civil? If you go against your employers policy could you be arrested and face charges from the government? Criminal consequences include jail time and fines and leave a permanent mark on your record. In most states however, ignoring the policies of your employer is not a criminal offense and thus you could not face charges. -What About the Parking Lot? Ask your attorney if your employer has the right to restrict you from keeping your firearm in your car in the parking lot. Most states protect your right to conceal your firearm in your vehicle regardless of where it is parked and the policies of the private property owner of that parking lot. If you work for a small to medium sized business you may have access to and a strong relationship with the business owner or policy maker. Approach them directly and express your desire to follow all the company policies but also your reasons for wanting to see a change in the policy or at very least an exception that can be made for you. Have in mind a few different potential exceptions that you would be happy to accept. For example your boss may not be willing to completely give you a pass on the policy but maybe they would be open to giving you a pass under certain circumstances. Ask for the Stars but be prepared to land on the Moon. If you work for a large organization there is likely a corporate emergency plan that dictates the course of action to be taken in the case of a fire, earthquake, power outage, or similar disasters. Ask HR if you can sit on a committee to help make this plan stronger. Expressing your desire to be involved may lead to you having some influence specific to the firearm policy. Despite the amount of time we do spend at work we still spend far more time outside of the workplace at home, shopping, dining, recreating, etc. You can and should consider how you can create a habit of re-arming yourself when you get home from work and putting the firearm on first thing in the morning on weekends or other non-work days. If you create a system around it and work hard for a few weeks at following that system you will create a habit. Our employee manual states that possession of a firearm is grounds for termination. I carry conceiled anyway. I am a maintenance man for a low income housing complex, so you can imagine the kind of people I deal with. There is also a lot of drug deals going on in the area. I will take my chances. I’d rather be unemployed than dead or disabled. Just remember that there are a number of types of employers that will NEVER allow you to carry a gun on premises. In TX, if you are a LTC holder you should leave it locked in the car unless you work at a federal facility. TX law prohibits an employer from allowing a licensed employee from having a gun in their car, even tf the employer provides the parking area. As an armed citizen for over 22 years, I can tell you this. The first rule of concealed is just that, hidden from view. The second is keep it to yourself–“Dude, check out my carry license! !”– If it’s my job or my life, I’m gonna have it in my car at work. No one needs to know, and you should tell no one. NO gun talk on your lunch break, etc. The element of surprise is the key to a successful self defense shooting, aside from accuracy of course. Stop yapping about your gun, keep it hidden, and leave the bosses out of your personal and constitutionally protected right to self defense. This is the best advice so far! With so many great ways to conceal carry without anyone but you and God knowing, you should pick the one’s best suited to you, your situation and gun. Secretcy must be absolute! Even your best friend talks out-of-school unintentionally. What’s at stake? Your survival! No-gun areas are actually denying you the right to defend yourself. And yet, they will not take steps to keep you safe. The only place you might not want to go against the grain are areas where they can legally search you! *Thumbs up* You couldn’t be more right. I believe that about a lot of things. Special places that are not crowded and beautiful are ruined because people tell everyone about the place that’s not crowded and beautiful. In a year or two, it’s over crowded with trash on all over the place. Humans don’t know how to shut up, that’s one of their biggest flaws. They like to divulge secrets and exaggerate about everything. The world is full of talkers. That was always my policy at work. Personal security is just that. Tell someone, and it becomes neither. I always carry because, well I am not Superman. My employer doesn’t want them in the building or even on the property for that matter, but I leave it locked in the car. Seeing as how I am the one patrolling the property I feel okay with that. But even if I did put it in my backpack, they would never know. Here in California you are not necessarily in violation of the laws unless you are asked to leave the property and subsequently refuse, then it is trespass. I work for a hospital that was a state-run facility. In 2013 we were privatized, but the buildings & grounds are still state property, and so I still cannot have my firearm on the grounds anywhere, even in my vehicle in the parking lot. Unfortunately, probably my most vulnerable time is walking to & from my vehicle at work, so even if my firearm was in my vehicle in the parking lot it wouldn’t do me any good! However, when I am at home or about town I carry. Legal carrier over 40 yrs, depended on “tear gas” “pepper spray/stream” devices for the interval until back in legal area. Not a great solution but when you draw brandish or fire, you’re hiring a lawyer almost automatically. It’s not the movies. I just don’t understand why the various levels of correctional facilities will not allow you to carry when the Cubans carry right next to the cons. Nowadays, DON’T ASK AND DON’T TELL is the unspoken policy adopted by many employers. In these cases, IWB, Belly Band, etc. conceal carry is crucially absolute! Keeping your unloaded gun in a locked box in your locked vehicle works well when it might be discovered while at work. Obey your local laws, but remember that only a Law Enforcement Officer has the right to stop and search you if probable cause exists. While I’m at work, conceal carry is prohibited, so I look for escape routes. I drove a truck for UPS Freight and Overnite Transportation prior to UPS buying us out… the policy was no firearms, period. I am retired now, after almost 30 years of trucking… I carried a legally licensed firearm for the entire time I was employed. I did not say anything about it to anyone but I figured, yes, they could fire me and yes… they could have done a lot of things but in the end, I had to make the judgement call and frankly, had I ever had the situation arise where that firearm may have been the difference between my coming home that week or lying on the ground bleeding out because some idiot decided to shoot me…. I chose the lesser of the two IMHO… that is the decision everyone has to make… it is a value judgement… I chose to carry.. you have to decide for yourself but do not judge another by your opinion.